Will Cain regain the UFC Heavyweight belt? Discussion in 'UFC Discussion' started by 20falarVerdades, Aug 7, 2016. He looked like an absolute beast against Travis Browne. His only bad match up in the division is Werdum who isn't getting any younger and seems to be out of the title path. I think he bullies Stipe the same way he bullied JDS and Overeem wouldn't be able to keep up with his pressure. BROWNPRIDE, Abazzdeboom, Teh_Lulz7 and 1 other person like this. yes, i think he will. i want to him to rematch werdum, though. then he should get a title-shot. I think he will. I also think the Werdum rematch will never materialize. Depends how high up it is. But yes he could. His biggest hurdle in his path is training at AKA. If he can stay healthy, he'll definitely win the title. If he can stay healthy he has a great chance. The man is a beast, no doubt. But I could also see him losing to Werdum, Reem, or Stipe. 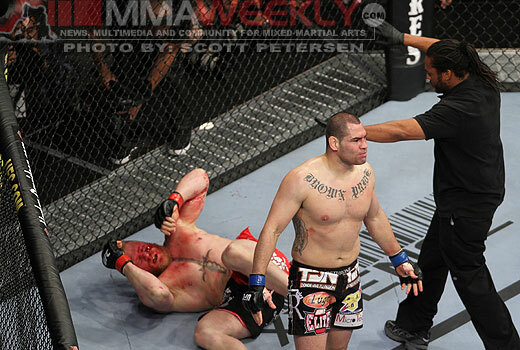 If Cain can put the injuries behind him then it is only a matter of time before he is the champ again. Cain is the best HW fighter in the history of the UFC. when at his best, he is unstoppable. so yes, absolutely. BROWNPRIDE and Death By Samson like this. No one in the division can keep up with his pace, his worst match up is Werdum since his threat of TDs are out the window there, on their feet, Stipe and Overeem can give him a hard time, but if they don't take him out early in the first, I can see both of those guys drastically slowing down by the middle of the second, especially Overeem. No. He will be beaten by Stipe, Ubereem, Werdum and Big Ben. HW division is weak with zero interesting prospects coming in. It'll be JDS/Miocic/Werdum/Cain/Reem playing hot potato until someone retires and then someone else old in the top 10 will fill their slot. Reem is Cain's nightmare matchup. Werdum still beats him IMO. If Stipe retains vs Overeem I could see it. Of course i believe in him. There is a really good chance. He isn't that old for a heavyweight, and he has a great style to beat almost anyone in the division. I think he needs one more win to get a title shot though, against either Werdum or Rothwell. How is he ever going to beat up Miocic? Let alone there are monsters like Tybura, Abdurakhimov, Magomedov and Milstead. Cain being a world champion again is nothing more than a fantasy. 1) distance from sea level of fight venues. From what I hear, Cain isn't even driving through Denver. And I would be amazed if he was popped for anything.